Revista’s conference highlights strong sales volume, NOI growth, etc. The slide showed that the average, nationwide same-store net operating income (NOI) growth for medical office buildings (MOBs) stood at 2.4 percent in the third quarter (Q3) of 2018. The figure represented a slight decrease from recent quarters, when the average NOI growth peaked at 3 percent during a handful of quarters in 2016-17. 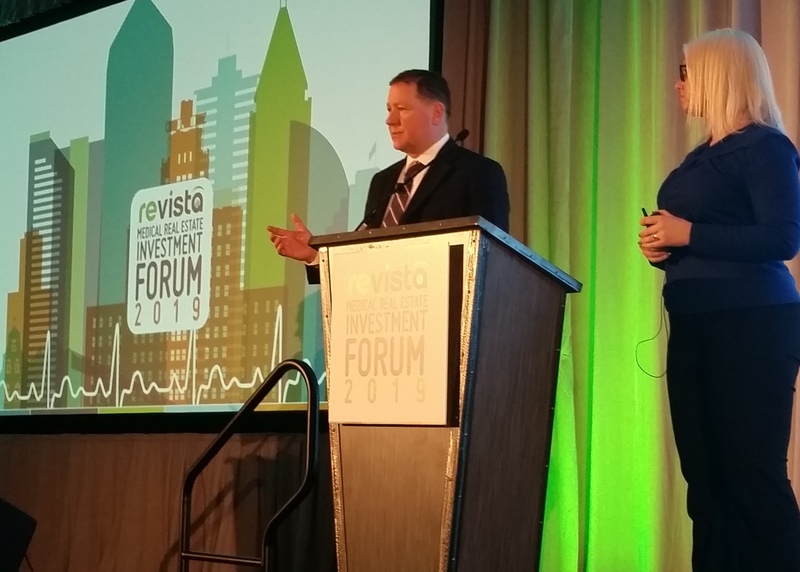 Mr. Hargrave and fellow Revista Principal Hilda Martin shared the data during one of several keynote presentations and panels discussions during the company’s fifth annual Medical Real Estate Investment Forum held Feb. 6-7 in San Diego. Their presentation, “Medical Real Estate Industry Update,” was rife with rich data highlighting MOB fundamentals, such as occupancy rates, investment sales trends, development and construction numbers and other interesting information, such as a recent spike in hospital construction. Although same-store NOI growth for MOBs was down slightly in 2018, Mr. Hargrave attributed the slight decrease to a small drop in the average occupancy rate nationwide, which stood at 92 percent in Q3 2018. The rate has fallen steadily from a peak of 92.6 percent in Q4 2016. “Even with the slight drop, occupancy rates for MOBs has been remarkably stable over the years, basically ranging from 91 percent to 93 percent over the last 10 years,” he said. When it comes to MOB sales volume, Revista’s figures for 2018, still preliminary at this point, saw $11.2 billion of transactions. Mr. Hargrave pointed out that although last year’s total was less than the record-breaking $15.8 billion in 2017, it was fairly typically of the past four years. Mr. Hargrave said that while private equity capital sources dominated MOB investment activity in 2018, accounting for 67 percent of MOB purchases – health systems accounted for 11 percent, while real estate investment trusts (REITs) made 20 percent of the acquisitions – that changed as the year came to a close. In Q4, the REITs rebounded and accounted for 41 percent of MOB sales. As Ms. Martin pointed out, Welltower still led all MOB investors in 2018 by making purchases totaling $916 million, topping the next two biggest buyers, MB Real Estate ($826 million) and Harrison Street Realty Capital ($707 million). While MOB fundamentals remain steady year after year, Mr. Hargrave noted that capitalization (cap) rates, or first-year expected yields, are starting to creep upward after a long period of record lows. The average MOB sales cap rate in 2018 was 6.5 percent, up from an all-time low of 6.1 percent sustained from Q3 of 2017 to Q1 of 2018. Interestingly, Revista’s data indicates that the rise in cap rates is being fueled by transactions involving what the firm considers “non-core” assets. For those sales, the average cap rate has risen from a low of 6.4 percent in Q3 2017 to 7.1 percent in Q4 2018. On the other hand, cap rates for the top properties, considered by Revista to be “core” MOBs, cap rates have hovered right around 5.5 percent since Q2 2017. Revista’s data also indicates that 874 HRE properties, with a value of about $70 billion were under construction as of the end of 2018. That includes a variety of project types, including MOBs, hospitals and others. Mr. Hargrave noted that about 21 million square feet of new MOB space, with a value of about $9.4 billion, is slated for completion in 2019, about the same as in 2018. As Revista’s data points out, more and more MOB projects are moving off campus. In 2019, about 69 percent of the new MOB space developed will be in off-campus locations, reflecting a steady increase from the 43 percent recorded in 2012. “This is the story that we’ve been talking about year after year, the retailization of healthcare delivery and the need of the health systems to get out into the communities,” Ms. Martin said. Hospital construction, on the other hand, will see a large increase in projects, square footage and dollar value in 2019. Revista’s data shows that 39.3 million square feet of hospital space, be it in new facilities, replacement projects or expansions, with a value of about $28 billion, are scheduled to be delivered in 2019, making strong increases from recent years, including a 72 percent increase in square footage over 2017. California, with its seismic safety requirements for hospitals fueling much of the construction spree, leads the country with 71 hospital projects under construction, Ms. Martin said.